Communities Joined in Action brings together community leaders from multiple sectors and walks of life from across the nation to learn with and from one another. Each year at the CJA annual meeting and conference, amazingly talented and committed community health groundbreakers come together to share lessons-learned and innovations. Together, these forward thinking leaders develop and leave with ideas, tools and action plans that improve health and eliminate inequities. Unleashing the Power of Communities To Improve Health: Accelerating Collaboration & Innovation will share evidence-informed and evidence-based practices in order to support communities accelerate and spread innovations that improve health and promote equity. Unleashing the Power of Communities To Improve Health: Accelerating Collaboration & Innovation will include compelling and highly interactive presentations by national, state and local leaders; focused workshops to share and discuss local innovations; and large and small group exercises to develop action plans. Spread approaches that promote better health for all people at less cost. Communities Joined in Action as part of, and in partnership with, the 100 Million Healthier Lives Leadership Team is excited to invite you to join us in the Washington, DC area on September 29, 2015! 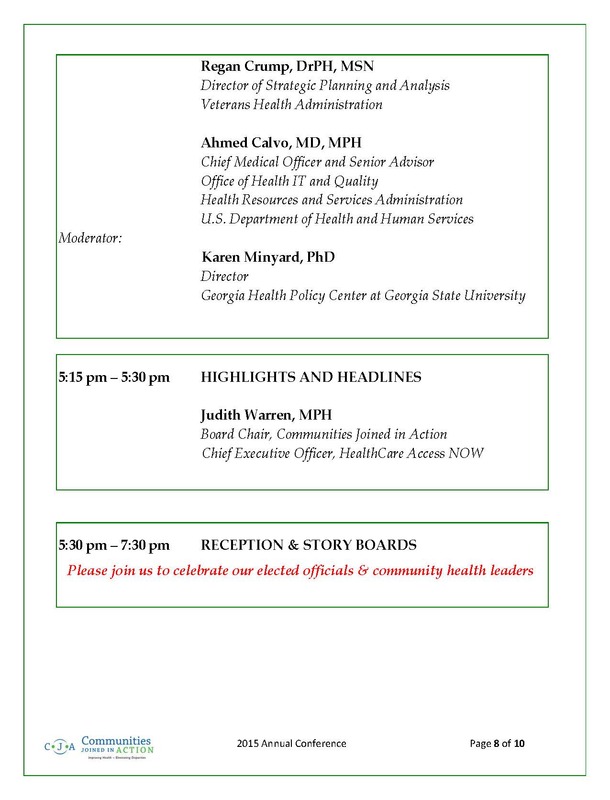 This FREE event is an amazing opportunity to meet and learn with leaders of the 100 Million Healthier Lives initiative, of which CJA is a proud partner. Please join us!! Communities Join in Action is excited to offer and invite you to participate in a few webinars to prepare you for your visit to the hill! 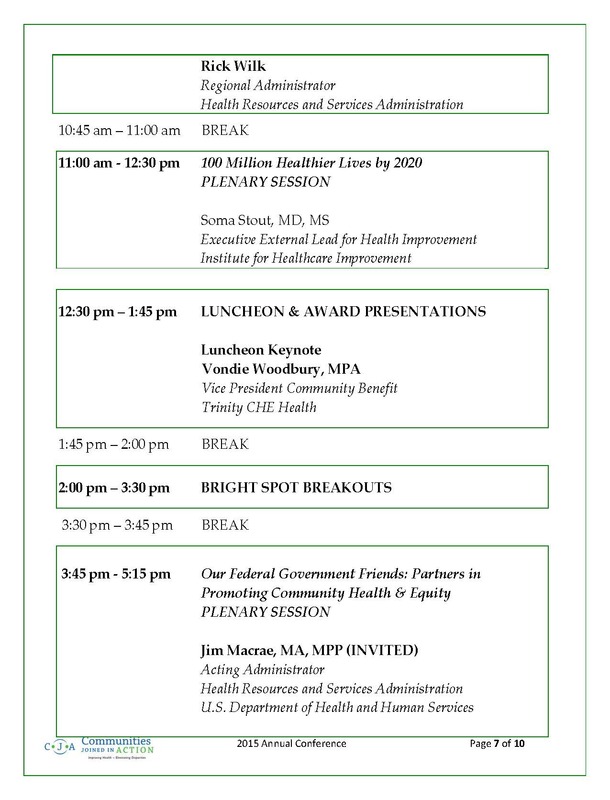 The pre-conference session is focused on community benefit and will feature the innovative work of Trinity Health. Trinity Health has 90 hospitals and facilities across the US and reinvests nearly 1 billion dollars annually. The session will feature keynote presentations painting a view of the national landscape of community benefit. Trinity’s Vice President for Community Benefit along with representatives from hospitals with mature community benefit programs will also participate in this 4 hour session. This exciting pre-conference session will discuss multiple funding strategies that support community care coordination and the Pathways Community HUB model, including contracting with Medicaid Managed Care and utilizing Relative Value Units (RVU). Representatives from local, state and national levels will share contracting and reimbursement strategies and assist you in determining how this could work in your community care coordination initiatives. Association for Community Health Improvement/American Hospital Association “Enterprising Health®, A model for Co-Creating Innovative and Sustainable Health Solutions with Members of the Community”Health care leaders spend countless hours designing interventions to address community health issues, many of which fail. The failure to impact the health status of the community is largely due to the lack of a true understanding of its members and their most pressing needs. In this session, participants will learn about the Enterprising Health model — using local community members as the best resource for finding innovative solutions to local health challenges, lessons learned while designing and implementing an innovative model, and the wonderful social enterprises that grew out of this model. Workshop participants will gain a deep understanding of how the model works through experiential exercises. This session is intended for anyone who develops programs/interventions for people in vulnerable communities. Session B “Learning What You Thought You Already Knew”“The power of the community to create health is far greater than any physician, hospital or clinic.” (Mark Hyman). Too often, the reverse appears to be the starting point, and it shows in the way partnerships, collaborations, and relationships are nurtured and built. This session will take a close look at how the Rural and Urban Access to Health (RUAH) Program is recalibrating the core of its mission and focus to reflect the power of community. The introduction of the program into the urban Indianapolis area will be the background from which lessons learned; current work and failures and successes will be shared. This session is intended for participants that want to learn how an exciting program redefines/reworks its integration within the community. Participants will leave with “real world” examples of how both big and little interactions add up to unleash and empowered community. Rural and Urban Access to Health “Showcasing Student Organizing Efforts to Improve Community Health”The creative use of existing resources is critical to improving the health of community populations. Organizations and coalitions can leverage an underutilized resource by engaging the passion and energy of local students in health disciplines. In this session, the Institute for Healthcare Improvement’s Open School student leaders will share how they are organizing for health and health care transformation, and how you can partner with them in your community. This session is intended for participants who want to learn about students who are mobilizing their knowledge of community organizing, improvement science, and systems thinking to improve the health of their communities; becoming aware of opportunities for organizations to partner with and leverage students. Session C “Partnering4Health: A National Collaboration Building Community Capacity to Promote Chronic Disease Prevention and Equity” In 2014, The American Heart Association (AHA), the National WIC Association (WIC), the American Planning Association (APA), the Society of Public Health Education (SOPHE) and the Directors of Health Promotion and Education (DHPE) were awarded funding to support community level health promotion efforts nationwide to address chronic disease and promote prevention efforts, in ultimately 100 communities during a three-year period. This initiative is referred to as Partnering4Health. The purpose is to reduce tobacco use and exposure, improve nutrition, increase physical activity, and improve access to chronic disease prevention, risk reduction, and management opportunities through the use of population-based strategies that create healthier communities. Collectively, these national organizations with their affiliated community groups are using evidence- and practice-based community health activities to reduce chronic diseases and health disparities, and strengthen the evidence for best practices that may be replicated by other communities. This session will provide an overview of the national project and is intended for participants who want to explore how policy, systems and environmental change strategies are utilized by the five national organizations to effectively implement Partnering4Health. National WIC Association “Engaging WIC Agencies in Community Health” WIC clinics are an access point to prevention and health care services for millions of families in approximately 10,000 clinics across the country. Given that WIC provides healthy foods, nutrition education, breastfeeding education and support, and referrals to clinical and community services, WIC families and staff have a wealth of expertise, relationships, and insight to offer community coalitions or other groups working toward improving the health of their communities. Using examples from seventeen WIC agencies in ten states engaged in the National WIC Association’s Community Partnerships for Healthy Mothers and Children project, we will discuss the roles that WIC agencies can play in transforming community health beyond the WIC clinic as well as the best ways to approach getting engaged in community-driven projects. This session is intended for participants interested in learning how WIC staff and clients can contribute to community health projects. Session D “Community Alignment by Convergence – Alignment of Health Equity and Developmental Initiative” The central goal of the Alignment of Health Equity and Development (AHEAD) initiative is to assist organizations in the alignment of EXISTING efforts within a community. This distinguishes the AHEAD approach from the blizzard of entrepreneurs flooding the field; each with an espoused new model and most of which ignore the many efforts that are already underway. With AHEAD, existing efforts are optimally leveraged by building mutually reinforcing links across the board and developing a coordinated and convergent effort. In this session, we will share the impetus, purpose, and core themes for this initiative. These include: Impetus) Expanded coverage and shift in financial incentives in health care; Health care providers/payers increasingly at financial risk for poor health; Emerging societal imperative to address fundamental inequities; Growing awareness of potential for alignment of health and community development sectors; Purpose) Build shared ownership for health in neighborhoods where inequities are concentrated; Explicit alignment of health sector services, programs, activities, and community development investments; Core Themes) Optimal leveraging of EXISTING resources; Make better use of current dollars; Support local infrastructure to manage, facilitate, evaluate, and sustain. This session is intended for participants want an opportunity to dialogue with experienced community and system change experts and exposure to some pragmatic tools. AHEAD PacificSource’s Coordinated Care Model – A Force for Community Health Oregon’s Coordinated Care Organization model (CCO) has gained national attention and has shown early signs of success at improving quality and curving costs for the state’s Medicaid population. Among the 16 CCOs statewide, PacificSource has one of the most unique local governing models. This has enabled accelerated change in key transformational areas, including addressing health equity via tangible solutions that ensure culturally and linguistically appropriate service delivery. This session is intended for participants who want to learn 1) The backdrop to Oregon CCOs and Medicaid transformation 2) New ways of thinking about local governance and stakeholder buy-in 3) How local governance married with community engagement can lead to policy change and equity, and 4) How PacificSource, as Payor, has led the advancement of community health solutions. Session E “Developing and Sustaining Multi-Sector Collaboration to Build Community Capacity in HIE”It is widely recognized that seamless Health Information Exchange (HIE) and the interoperability of health information technology are fundamental to an integrated community health care delivery system. The Department of Health and Human Services, Office of the National Coordinator for Health IT (ONC) provided $250 million over three years (2010-2013) through the Beacon Community Program to 17 selected communities throughout the United States to build and strengthen health IT infrastructure, test innovative approaches, and make strides toward better care, better health, and lower costs. With that capacity communities are poised to realize Triple Aim goals of improved care coordination, better population health outcomes and lower health care costs. Using the example of developing and sustaining electronic health information exchange (HIE) capacity in the Beacon Communities, participants will learn about the innovative and successful approaches, designs and best practices for multi-sector collaboration. This session is intended for participants who want to know best practices to engage, empower and mobilize multi-sector key stakeholders to build and sustain community capacity in HIE. Trega Partners International Pathways Community HUB – A Community Approach to Achieve the Triple Aim Pathways Community HUBs in Ohio are advancing health improvement, achieving better health outcomes for high risk, high cost consumers contracting with health plans. Two HUBs, Health Care Access Now & the Lucas County Initiative to Improve Birth Outcomes will share strategies for integrating community-based care coordination with providers. Presenters will discuss innovative ways of contracting, staffing and managing data across systems of care. Presenters will demonstrate how HUBs are a viable and cost effective approach for health systems who are considering population health interventions and transitions of care for minority populations and other targeted groups. This session is intended for participants who want to learn how to operationalize the Pathways Community HUB model: Infrastructure & design components in addition to those who want to engage in interactive discussion on challenges & opportunities for addressing “hard to reach” consumers.